A few years ago, my wife and I decided to keep a TV diary to see which networks we watched. It turned out that 90% of the time we were watching networks like ABC, NBC, CBS, and Fox. These channels are on broadcast television and can be received for free, in HD, and have a crystal clear picture by using an over the air antenna. After realizing we were spending $200 a month on cable TV for 10% of the shows we were watching, we decided to just watch TV without cable. If you are thinking about cutting the cord, a quality antenna will provide tons of TV programming for free. 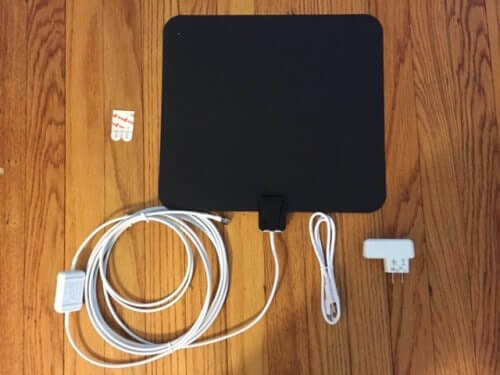 Recently, Winegard sent me their FlatWave Amplified Indoor Antenna to test and share my experience with you. Let’s see if the FlatWave is the cable slayer you’ve been looking for. The FlatWave Amped HDTV Antenna is razor thin and extremely lightweight, yet feels quite sturdy. It comes with everything you need to set up the antenna. In a unique design choice, the coaxial cable and amplifier are integrated into the antenna. The amp requires power, but that can be supplied by a USB port on the TV. If your TV lacks a powered USB port Winegard included a USB power supply that can plug into a wall outlet. It’s possible to leave the antenna amplified by simply not cupplying power. I tried this, and the antenna was able to receive high powered signals in my area. I applaud Winegard for putting together a detailed instruction manual. It was a pleasant surprise. Typically, products like these contain a piece of paper explaining how to connect antenna to the TV and a link to their website if you have any problems. Winegard took it a step further and gave a high level explanation on how placement affects reception. They also included a well executed troubleshooting guide in case any issues arise. Well done Winegard! Hooking this antenna up is a breeze. Simply connect the coaxial cable to the antenna connection on your television. Next, connect one end of the USB cable to the amplifier and the other end to either your TVs USB port or the USB power adapter, which is plugged into a standard power outlet. Once the antenna is hooked up you want the antenna positioned so either flat side of the antenna is facing the TV towers in your area. 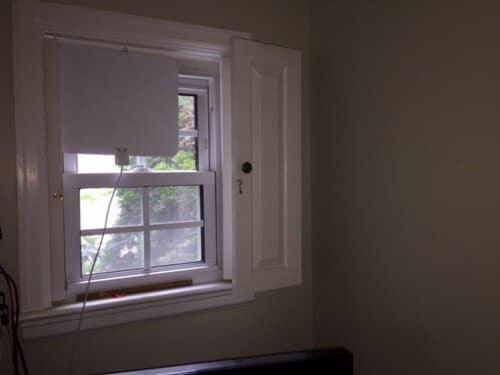 Your first choice should be a window, preferably without a metal screen in front. This will greatly reduce signal interference. If it’s not possible to mount the antenna with the flat side facing the towers, the next best option is to point the antenna toward the ceiling. You can check out my guide on maximizing TV antenna reception for more information. 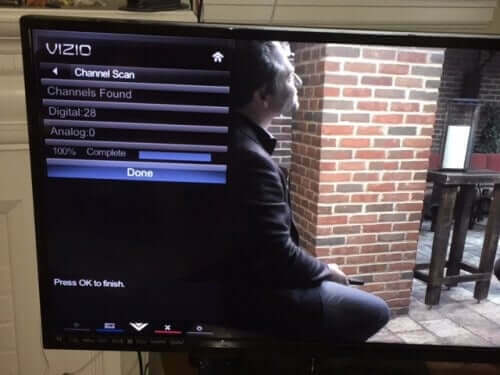 Once the antenna is hooked up and in position, set your TV input to your antenna and do an automatic channel scan. This is typically done in the “Settings” tab on most TV menus. If you have trouble locating it check your TV manufactures website. As you can see the FlatWave picked up 28 channels. The antenna did a great job of holding the picture, even with channels that had lower signal strength in my area. TV signals vary from place to place, but I can give you an idea of what to expect from the FlatWave Amped. Below is a chart showing the available channels around my house. 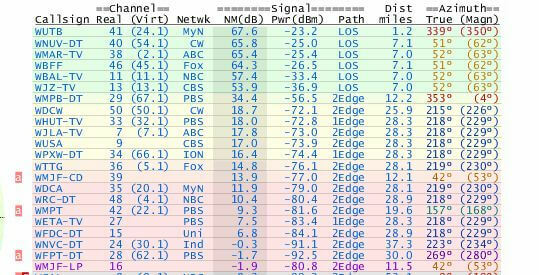 The channels marked in green indicate a signal that can be received with an indoor antenna, while yellow indicates those requiring an attic mounted antenna. The red rows indicate channels that may require a roof mounted antenna. The FlatWave Amped HD Antenna was able to receive Channel 66 (ION). The chart recommends an attic mounted antenna to receive that channel. Very few indoor antennas will be able to achieve results like these. You can trust that the Winegard FlatWave Amped is a solid antenna when it comes to performance. The only drawback I can see is the cord and amp being built into the antenna. This creates an issue if the amp ever fails or you need to replace the cord. 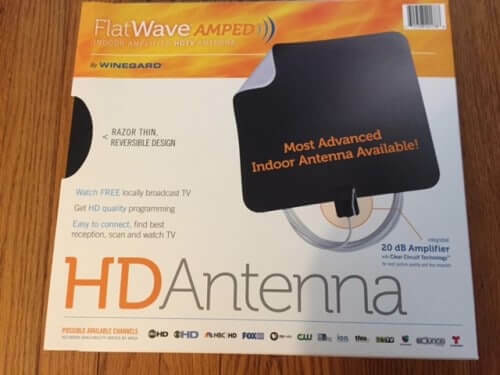 Aside from that concern, the Winegard FlatWave Amped HD Antenna is a well made antenna that provides excellent reception. If you want to purchase a FlatWave antenna, purchasing through the link below supports Grounded Reason as Amazon pays this site a small commission.